Scientists have discovered a new family of molecules that work together to precisely remove unwanted DNA during reproduction in single-celled, freshwater organisms called ciliates. The discovery of these new molecules has profound implications for our understanding of the mechanism of gene removal (or 'excision') and rearrangement which plays a crucial role in the development and evolution of many species. The findings are published in eLife. Transposons are pieces of DNA that move around in the genome, transported by enzymes called transposases that bind to them. As transposons jump around during evolution, host organisms can acquire the genes they carry and use them to gain new functions in a process known as domestication. Transposases from a family called PiggyBac have repeatedly been domesticated in various organisms. 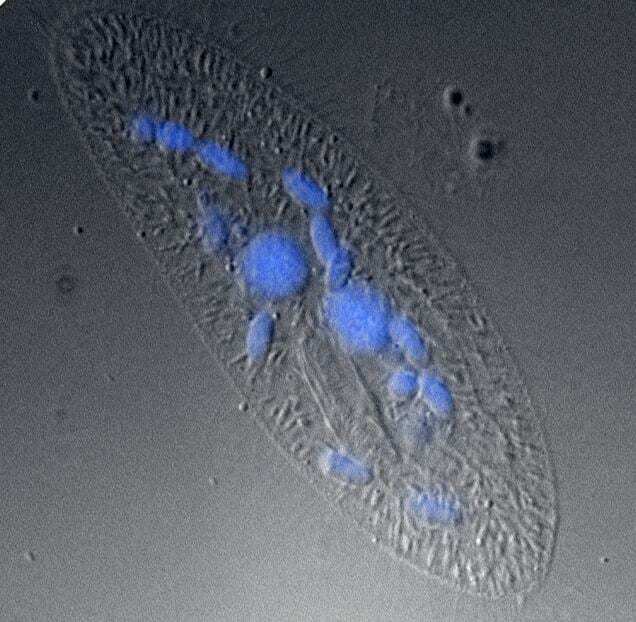 Although their function is poorly understood, they are known to play an essential role in the reproduction of ciliates, such as Paramecium. When these single-celled organisms reproduce, they undergo huge genome amplification and removal of a significant proportion of repeated genetic material, including transposons. This includes the precise excision of 45,000 non-coding pieces of DNA (called Internal Eliminated Sequences), which would otherwise interrupt 47% of all genes in the genome. "We knew that PiggyMac, a domesticated transposase in the PiggyBac family, was responsible for cleaving the DNA, but what we didn't know is exactly how the removal machinery is accurately positioned at the ends of this DNA," explains lead author Julien Bischerour, researcher at the Institute for Integrative Biology of the Cell, CNRS, University of Paris-Saclay, France. In this study, the team identified five further groups of the PiggyBac family of transposases that work together with PiggyMac to accurately delete specific pieces of DNA in the Paramecium genome. By silencing the different domesticated PiggyBac transposases, they found that each group plays an architectural role and is essential for the movement of PiggyMac to the cell nucleus during reproduction and subsequent gene removal. Moreover, blocking the activity of the PiggyBac transposases caused a number of errors in the removal process. This showed that some family members retained activity, but the process became less efficient and accurate. It also revealed insights into the preferred lengths of DNA cleaved by these molecules. The fact that some sequences were mechanistically difficult to remove shed new light on potential constraints on gene deletion in Paramecium during evolution. "Our discovery of novel PiggyMac partners, coded by five groups of duplicated genes in the Paramecium genome, brings new insight into the removal mechanism of these non-coding sequences by transposases and deeper understanding of the machinery involved," explains senior author Mireille Bétermier, researcher at the Institute for Integrative Biology of the Cell, CNRS, University of Paris-Saclay. "Based on our work, future investigations into human domesticated transposases should take into consideration the possibility that these molecules may be involved together in the same cellular function." The paper 'Six domesticated PiggyBac transposases together carry out programmed DNA elimination in Paramecium' can be freely accessed online at https://doi.org/10.7554/eLife.37927. Contents, including text, figures and data, are free to reuse under a CC BY 4.0 license. eLife aims to help scientists accelerate discovery by operating a platform for research communication that encourages and recognises the most responsible behaviours in science. We publish important research in all areas of the life and biomedical sciences, including Chromosomes and Gene Expression, which is selected and evaluated by working scientists and made freely available online without delay. eLife also invests in innovation through open source tool development to accelerate research communication and discovery. Our work is guided by the communities we serve. eLife is supported by the Howard Hughes Medical Institute, the Max Planck Society, the Wellcome Trust and the Knut and Alice Wallenberg Foundation. Learn more at https://elifesciences.org/about. To read the latest Genes and Chromosomes research published in eLife, visit: https://elifesciences.org/subjects/chromosomes-gene-expression.